William Mathers, MD, Professor of Ophthalmology at Oregon Health and Science University - Casey Eye Institute. Former Consultant to Bio-Logic Aqua Research. Q. How did Nature's Tears EyeMist come about? A. Ophthalmologists have long been concerned that artificial tears with eye drops for dry, irritated eyes, flooded the natural tear film, increasing moisture evaporation (by washing away the tear film's lipid layer) and often exacerbating the condition. Bio-Logic Aqua Research, which had been researching moisture utilization by the skin and eyes, was approached by eye doctors regarding an all-natural, non-eye drop application for dry, irritated eyes. The result was Nature's Tears EyeMist. Q. What is the role of the tear film in dry, irritated eyes? A. The human tear film, covering the cornea's external surface, has three layers. The deepest layer, against the cornea, is the mucin layer required for smooth adherence to the cornea. Next comes a thicker aqueous layer with proper salinity and dissolved beneficial proteins. On the surface is a thin lipid mono-layer that retards evaporation. The discomfort and blurring of dry eye begins with the evaporation of pure water from the aqueous layer. This thins the layer and increases the concentration of dissolved electrolytes and beneficial proteins. These dissolved substances keep the eyes comfortable and safe from infection but when they become unnaturally concentrated, burning and stinging result. Q. Why are traditional products for dry, irritated eyes frequently ineffective? A. All previously available dry eye products, so-called "artificial tears," are administered as drops of about forty micro-liters, enough to replace the entire tear volume ten times over. This floods the tear film and flushes away lipids, beneficial proteins and salinity. The mucin layer is thinned, the aqueous layer is totally replaced with a water solution of artificial ingredients containing no enzymes, growth factors or antibodies, and because the lipid layer has been washed away, evaporation increases. Q. How does Nature's Tears EyeMist differ from eye drops? A. Nature's Tears EyeMist utilizes an entirely different approach to correcting the tear film in a person with dry, irritated eyes. By misting the tear-film surface with sub-micro-liter droplets of very pure water, the thickness and concentration of the aqueous layer can be restored to normal without losing the lipid layer or beneficial proteins. Nature's Tears EyeMist is the first optical application (patent pending) to utilize a water mist rather than chemical eye drops. Q. How does Nature's Tears EyeMist relieve eye irritation? A. Insufficient tear film moisture causes ocular discomfort by abnormally increasing the concentration of electrolytes and proteins in the tear film. Nature's Tears EyeMist alleviates this by restoring tear film moisture, and the concentration of electrolytes and proteins, to normal, healthy levels. As the tiny droplets arrive at the surface of the tear film, the lipid layer parts and reseals (think of adding a drop of vinegar to a bottle of oil and vinegar). After passing through the self-healing lipid layer, the Nature's Tears EyeMist droplets join, and then diffuse into the aqueous layer, restoring its volume and reducing the concentration of dissolved substances to normal, comfortable levels. Beneficial proteins are still present and the mucin layer is not disturbed. Research indicates that the addition of only three to five nanoliters of pH-correct (6.49), hypotonic, bio-compatible water, will restore tear film moisture and osmolarity. Q. When should Nature's Tears EyeMist be used? A. Nature's Tears EyeMist is specifically indicated for patients who do not tolerate artificial tears well. In addition, the product benefits every disorder whose symptoms include dry, irritated eyes. Patients with eye irritation (dryness, burning, itching, fatigue, etc. ), from dry eye, contact lenses, post-Lasik surgery, computer eye strain, lupus, scleroderma, harsh indoor and outdoor conditions, airline travel, sports activities, smoke, dust, air pollution and low humidity will all benefit. The mist is effective in all climates and for all ages all over the world. Best results are obtained if the mist is applied properly, which may require a small amount of instruction and practice. Q. Are there dosage limits or contraindications regarding the use of Nature's Tears EyeMist? A. No. Nature's Tears EyeMist is 100% safe and may be used as often as necessary, even by patients with severe dry eye. The product may be safely used with any other eye application or medication.
" Sjogren's, diabetic, sheet rock layer - six mist applications per day. Q. How long should a one-ounce mist bottle last? A. About one month, depending on the frequency of use. Properly applied, one bottle contains approximately 100 sweeps (one to two seconds each) across the eyes. Q. Has the effectiveness of Nature's Tears EyeMist been clinically verified? A. Yes. In a 2002 study, dry eye patients reported Nature's Tears EyeMist to be more effective (72%) and more convenient (83%) in relieving eye discomfort than conventional eye drops (Mist Supplementation of the Tear Film for Dry Eye; by Mathers, W., MD; Paden, P.Y., MD; and Oxford, J., PhD. ; July, 2000). See also the three-minute CD-ROM animation, Nature's Tears EyeMist Versus Conventional Eye Drops, Bio-Logic Aqua Research, 2003. Q. What is Biologic Aqua®? A.	Bio-Logic Aqua® is the sole ingredient in Nature's Tears EyeMist. It is an "Absolute Premium Standard" tissue-culture water possessing rare properties ideal for optical use. The hypotonic, low-osmolarity water has a slightly acidic pH-balance (6.49), low solute content and purity that is naturally biocompatible with the tear film. "Tissue-culture grade" means the water has been clinically documented as suitable for use as a standardized tissue-culture medium in biological laboratory experiments. Dr. Julia Oxford, PhD, of Boise State University, has conducted studies confirming that in contrast to most waters, the rare properties of Bio-Logic Aqua™ result in much greater absorption into external human tissues, stimulation of cell replication and growth and improved tissue health. Q. Is Nature's Tears EyeMist FDA approved? A. Since Nature's Tears EyeMist is an all-natural product containing only pure water from a pristine spring, no FDA approval is required. This product is not a drug and contains no allergens, irritants or added ingredients. Q. Does the company test the water for purity? A. Bio-Logic Aqua tissue-culture grade water is constantly monitored for variations in mineral content and purity. The water source has remained exceptionally stable. Q. Is Nature's Tears EyeMist safe and sterile? A. Nature's Tears EyeMist is bottled by Bio-Logic Aqua Research to U.S. Government and FDA pharmaceutical standards of sterility and cleanliness in handling and packaging. Because there is no eye touching during application, the mist may be safely applied even under adverse or unsanitary conditions, without hand-washing. The easy-to-use atomizer avoids the need for head-tilting, spreading the eyelid or accurate placement into the eye. Bio-Logic Aqua Reaearch, founders of Nature's Tears EyeMist and other all-natural all-water moisturizing products, is the first company to specialize in bottled water for pharmaceutical use and is establishing standards for the industry. Q. How do I apply Nature's Tears EyeMist? A. Hold dispenser about 8 to 12 inches from eyes and press the top of the atomizer, misting for 1 to 2 seconds in a sweep across both eyes while keeping eyes open. Do not aim directly at eyes. To avoid reflex blinking, begin by pointing the mist at the side of your eyes. Breathe in the mist to refresh nasal passages. The mist application supplies not only sufficient moisture to replenish the tear film in both eyes, but it also moisturizes the eyelids and the facial skin around the eyes. For best results, do not hold the bottle too closely or mist for too long. Demonstration to patients by a medical professional is extremely helpful, as is having the patient mist in front of a mirror. Nature's Tears EyeMist does not disturb eye or facial make-up. Q. Where can I learn more about or purchase Nature's Tears EyeMist? A. 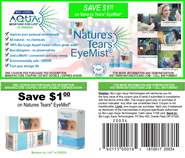 Nature's Tears EyeMist may be purchased in select drug stores, at the website www.naturestears.com, at Amazon.com and Drugstore.com, or by telephone at (800) 367-6478.